The Mashable published 10 Chrome extensions for web developers and I bet web developers like you yourself must be using some of them. Do you have your own favourite extensions? Do share with us. The Mashable published 10 Firefox Add-Ons for Designers and I bet web designers and web developers like you yourself must be using some of them. Do you have your own favourite add-ons? Do share with us. The Mashable published 10 Firefox Add-Ons for Developers and I bet web developers like you yourself must be using some of them. Do you have your own favourite add-ons? Do share with us. In my own opinion, HttpFox should be the other worthy mention add-on. How does it look like in major cities at night without lights? Ever wonder how does it look like at night without lights? A New York City-based photographer who spent the last two years documenting glaciers around the world produced his impression in major cities - dark, star-lighted sky, and sometimes can be cold. A FREE Android app that lets you create a list of apps that are allowed to light the screen up and show their notifications on it as a popup in front of your lock screen. Quite a comprehensive guide on setting up Tiny Tiny RSS as your Google Reader alternative and hosting it without fear that your feeds will be gone. Looking for HTML5 websites for inspiration? Webrevisions published an article recently introducing 18 such websites. What a resource for web designers and developers - 40 Useful Cheat Sheets For Designers and Developers. Let's say we have a table with a column of numbers and for some reason, they are not in running sequence. Instead of editing the rows manually, we can actually do it using a SQL script. This is really looking like Samsung is building its own ecosystem. Looks like there is going to have more and more Samsung in-house apps and a growing personalisation going on in an Android phone. Samsung introduced together with the Samsung Galaxy S 4, 11 accessories for the Samsung Galaxy S 4. The accessories are: S Band, S View Cover, Game Pad, Wireless Charging Pad / Cover, Flip Cover, Pouch, Protective Cover+, Headset, Extra Battery Kit, HRM and Body Scale. Most of the accessories can be used by Samsung’s S-Health 2.0 application. McDonalds Singapore is participating its "National Breakfast Day" by giving away 1,000 Egg McMuffinTM absolutely FREE per participating stores, while stocks last, on 18 March 2013 (coming Monday). McDonalds will give away Free Egg McMuffinTM Giveaway coupon at its participating stores on 18 March 2013. Recipients will then have to present the original coupon on the same day in the morning for redemption. More information on the giveaway can be found at www.mcdonalds.com.sg/nbd/. I am putting across a serious note on Kaspersky products blocking domains including Google, Facebook and Twitter. From my experiment, it seems this is true when I am using Google Chrome browser. Have tried to contact Kaspersky via Twitter but am ignored completely. A quick web search on the world wide web reaffirmed that this is not affecting just me, but possibly thousands others as well. The Kaspersky product I am using is Kaspersky Endpoint Security 8 with the latest database definitions installed as of today. I am not too sure if other Kaspersky variant products are having similar restrictions too. Right now, I have to add the above domain names (will be growing) as trusted urls to be able to consume content normally. Please let me know any other domains blocked by Kaspersky so I can add them here too to benefit everyone. If you are still unware, Google will be axing Google Reader on 1 July 2013. Do participate on online petitions hoping the popular service will stay! Ever wonder why is Google killing Google Reader? Here is a word from former Google Reader Product Manager, Brian Shih, on this. Since Google Reader started 8 years ago, I have been a great fan of it, using it on a daily basis. It is indeed sad to hear we will have to bid farewell to Google Reader on 1 July 2013. Immediately after the closure is announced, online petitions started and quickly begin to receive signatures in tens of thousands on same day. Do participate in them and hopefully Google will listen for once. Objective is to hope Google Reader will stay alive. Objective is to get Google Reader open sourced so enthusiasts can run the web application themselves. This is with the understanding that Google will not reverse its decision to axe Reader. I trust Google to product excellent product and not to discontinue just because it is not generating money out of it. It is indeed very sad news coming from Google - Google Reader is to be discontinued from 1 July 2013 onwards. This is Google's yet another round of spring cleaning effort. Google also advised in their support page on how to go about downloading your data so you can bring your RSS subscriptions to a RSS alternative. The closing of Google Reader must have upset several users including myself and Americans have already started putting up a petition to Keep Google Reader Running. To date, the petition has garnered over 26,000 signatures. Google launches a new support website to provide help to webmasters if their sites are hacked. For instance, your website will be labelled as "harmful" by Google if it is suspected to hacked. Google offered several advices and a video for such scenarios. Do watch and read the advices. Samsung released Part 2 of their teaser video to their soon-to-be-announced Samsung S IV phone. You may visit part 1 too. Insightful article on When Responsive Web Design Is Bad For SEO. sp_MSforeachdb is an undocumented stored procedure since SQL 2005 that can come in real handy, looping through all databases to get information without having to write cursors. The idea of its usage is to use the [?] placeholder and SQL will intelligently do a replace with a database name. Just some sample usage of sp_MSforeachdb. Undocumented may mean it may not be supported in future versions. My last check is sp_MSforeachdb still works for SQL 2008.
sp_MSforeachtable is an undocumented stored procedure since SQL 2005 that can come in real handy, looping through all tables in a database to get information without having to write cursors. The idea of its usage is to use the [?] 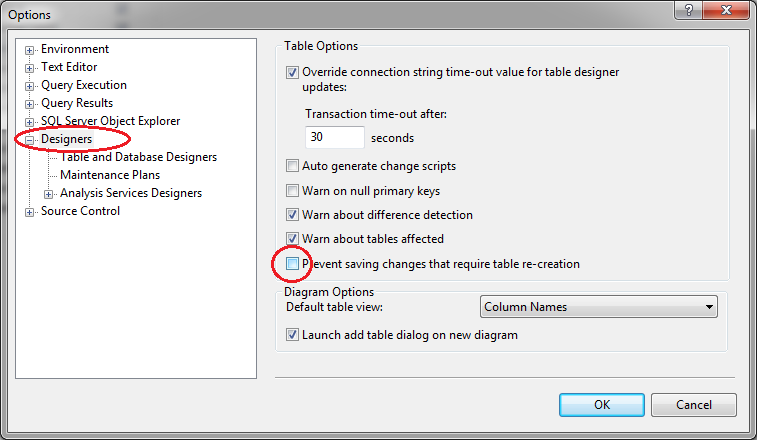 placeholder and SQL will intelligently do a replace with a table name. Just some sample usage of sp_MSforeachtable. Undocumented may mean it may not be supported in future versions. My last check is sp_MSforeachtable still works for SQL 2008. How to block/unblock Messenger contacts after migration to Skype? After having moved my messenger to Skype for a few weeks, the experience is like taking 100 steps backwards. Other than once encountering login issues, my impression on Skype has reached new bottom. On the first day when I first migrated to Skype, messaging my contacts encountered problems. I soon realised that's all because I appeared offline on Messenger previously. A quick resolution not to lose all these contacts is to go back to Messenger, appear online to all contacts, exit from Messenger, then login to Skype again. Why didn't Skype think of this and do a proper synchronise job. Blocking a messenger contact is so damn difficult on Skype. I repeat again - MESSENGER contact. The reason for repeating is because blocking a Skype contact is a few clicks away within the Skype program itself but NOT for a MESSENGER contact. To block a messenger contact, you can only do it from Microsoft Live People page. Login to Windows Live account http://www.outlook.com on your preferred browser. Click on the down arrow from the top menu followed by the People option. 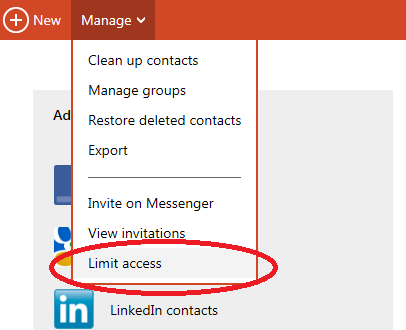 Then go to Manage > Limit Access. 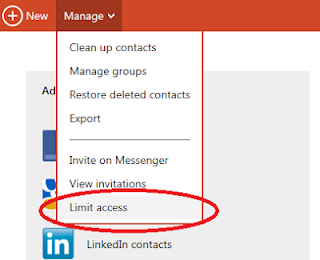 You may then limit access to selected contacts on this page. NOTE: It is required to re-login Skype for the block/unblock to take effect. # The contents of this file are released under the GNU General Public License. Feel free to reuse the contents of this work, as long as the resultant works give proper attribution and are made publicly available under the GNU General Public License. # Best viewed in emacs org-mode. # Redirect standard output and error to /dev/null, where it is deleted. # && acts like ; but only executes command_2 if command_1 indicates that it succeeded without error by returning 0. # || acts like && but only executes command_2 if command_1 indicates an error by returning 1. # Connect to a remote server. #you need to make sure you have the right kernel modules. You can do this with modprobe, but this package works instead in a ubuntu-specific way. Moving forward, I will be writing more articles on tips and tricks in doing things. How to get the new Facebook Newsfeed (Google+) look? Facebook announced a revamp on its Newsfeed putting more emphasis on the news area. My take on the new look reminds me of Google+. Facebook must have taken some design cues from Google+ and incorporating them onto theirs. Study Facebook’s New News Feed: The Before & After Look and see for yourself. Ok, so how do I opt in to the new Newsfeed? Click this link, scroll all the way down and then click on the "Try the new look" button. You will be placed in the waiting list. I woke up in the morning finding myself unable to log myself onto Skype to access my Messenger contacts. After figuring out for some time and sometimes even accusing my anti-virus program, I conclude this is a problem with the Skype installed on my laptop, since I am having no problems with Skype on my Android. To resolve the login problem, I attempted to remove my profile completely. This seems to have resolved everything. 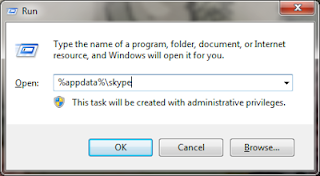 Before performing the following steps, make sure Skype program has exited i.e. Skype shouldn't even be lurking in your system tray. Delete the folder bearing the name of your Skype login name. It may be in the form of <username> or live#<username>. Your Skype should run okay now. For Mac users, the path is User/Library/Application Support/Skype. Sometimes when you are working something using SQL Management Studio (SSMS) and intend to make changes to existing table schema, e.g. adding a new column, you may encounter the following error message. You are unable to proceed making the changes you desire with SSMS user interface. So what can you do? 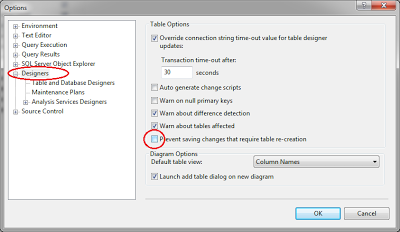 Either you re-create the table or write ALTER statements (but let's not do that!). 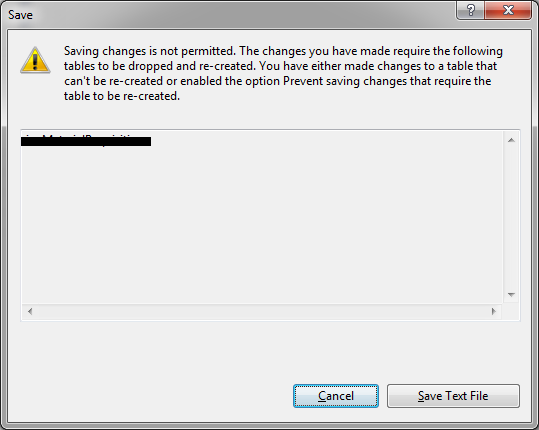 There is, however, a known trick to get around the above annoying "Saving changes is not permitted ..." error. Here are the steps to do just that! From the SSMS, go to Tools > Options. 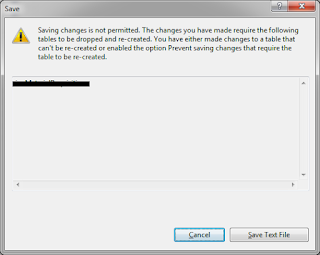 Un-check "Prevent saving changes that require table re-creation". Just as I posted "Every student in every school should have the opportunity to learn to code" few days back, there is another article saying Programming Is Not For Everybody. I sort of quite agree with the latter article especially on the last statement for some people. A lot of time, it’s sitting in front of a computer screen, looking at a colorful text document, and thinking, and thinking, and typing, getting angry, and wondering why the hell you’re living a life sitting down. Part 2 of the above video is out now. YouTube has joined Harlem Shake. Simply perform a search on 'do the Harlem Shake' on YouTube to reveal the Easter Egg.